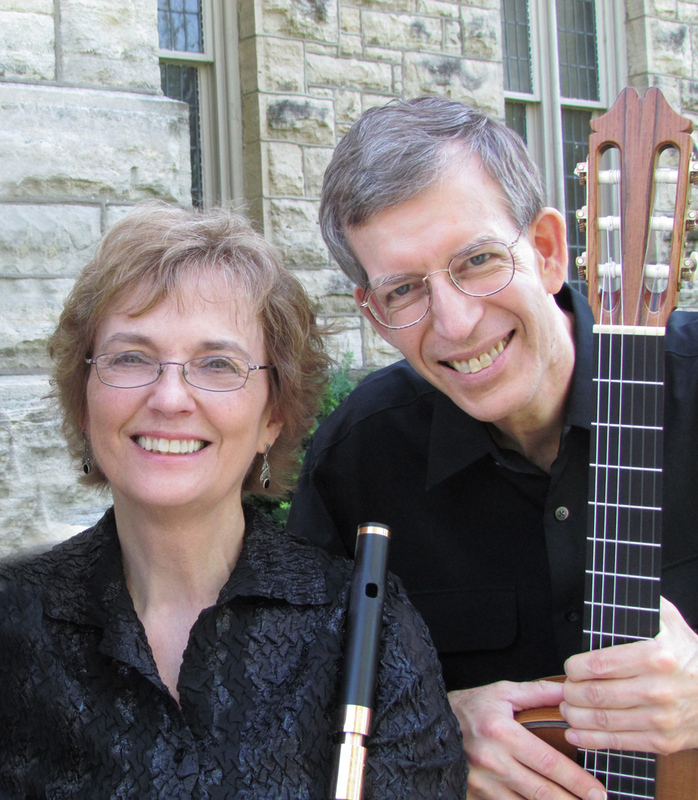 Jan Boland & John Dowdall have concertized together as the Boland-Dowdall Flute & Guitar Duo since 1979. For twenty years they were the core ensemble of the 501(c)3 organization Red Cedar Chamber Music, an organization they founded together in 1997. The Duo tours locally, nationally and internationally, bringing innovative and entertaining concert projects and residency programs to broad and diverse audiences. Boland & Dowdall began collaborating while doing graduate work at the University of Iowa. Each had an avid interest in music history and early music performance practices. Eventually their researches and interests led them to a specialization of early 19th-century music on period instruments. Today, their music gives listeners equal doses of the antique and the avant garde; in addition to their early music performances, they annually commission and premiere new works by leading composers. Together, and with collaborations with others, they recorded thirteen (13) commercial compact disc recordings on the Fleur de Son Classics, Titanic Records and Koch International Classics label. Guitarist John Dowdall is a professional chamber musician and musicologist who specializes in performance on early nineteenth-century guitars. In 1992 the National Endowment for the Arts awarded him a Solo Recitalist Fellowship for performances of nineteenth-century chamber music. He performs with the Boland-Dowdall Duo, winners of the l987 Professional Chamber Music Competition sponsored by the National Flute Association, touring throughout the United States and Europe. He has appeared at the Boston Early Music Festival and played the first dedicatory recital at the newly renovated Shrine to Music Museum in Vermillion South Dakota, one of the world’s leading instrument museums. He was featured with the Boland-Dowdall Duo at the fifth Tage Alter Musik festival in Regensburg Germany in May l989 and in a series of five concerts in and around Boston under the sponsorship of The Cambridge Society for Early Music in January of 1992. In August of 1993 he performed in Magnano, Italy for the Festival Musica Antica a Magnano, and in 1994 he performed at the Metropolitan Museum of Art in New York using instruments from the museum’s collection. In 1999 the Duo appeared at the Kennedy Center on the Millennium Stage Series. In 2007, Dowdall’s chamber music performances were featured on the syndicated program of National Public Radio Classical Guitar Alive titled “Rising Stars. He has performed at the National Convention of the Music Teachers National Association and has given lecture/recitals on Nineteenth Century Flute and Guitar Duets at a Symposium of the Guitar Division of the American String Teachers Association and at a joint meeting of the American Musicological Society and the American Musical Instrument Society. He has also appeared as a guest performer at National Flute Association conventions on numerous occasions. His compact discs titled Giuliani, Hummel et al. A Potpourri of l9th-Century Salon Music on Period Instruments (1988), and Rossini, Mozart et al. Serenades for the l9th-Century Salon (1992) were each named Recording of the Month by Alte Musik Aktuell of Regensberg, Germany. These recordings include a unique collection of original editions of 19th-century salon music which Dowdall presented in his MA thesis, Early l9th-century Duets for Flute and Guitar in the Library of Congress. Both discs are on the Titanic label and feature Dowdall on l9th-century, gut-strung guitar and his partner Jan Boland on keyed, wooden flutes. His later compact discs totaling 10 are on the Fleur de Son Classics label. Also active as a composer/arranger, his Christmas Medley of l9th-century Carols for Flute and Guitar and The Foster Collection: Music of Stephen Foster arranged for flute and guitar are published by ALRY. He studied at the Hochschule fur Musik in Vienna and holds degrees in guitar performance, music theory and musicology (MA, University of Iowa, 1982). He studied with Jeffrey Van and Karl Scheit. Flutist Jan Boland has been praised by critics in Germany, the UK and the US for her chamber music interpretations and solo performances. The American Record Guide declared “this is chamber music as it should be – intimate, bonding and conversational.” A review of her concert with John Dowdall at the German festival Tage Alter Music recounted, “Their concert must be counted among the high points of the festival. Above all, Jan Boland was brilliant on the flute and brought an unorthodox, provocative flute interpretation to the highest technical level.” Musica Sacra. Dr. Boland is a leading proponent in the performance and interpretation of music of the nineteenth century on period wooden flutes. On opposite side of the spectrum, she collaborates several times each year in commissioning and premiering new music on modern flute. Jan’s live chamber music performances with Red Cedar Chamber Music are regularly heard on National Public Radio’s Performance Today. With John Dowdall, her live performances and conversations have been featured on WGBH Boston, PBS, Iowa Public Radio, and Iowa Public Television. Invitations to perform at international festivals have come from Tage Alter Musik (Regensburg, Germany), Festival Musica Antica (Magnano, Italy) Boxwood (Nova Scotia), British Flute Society (Manchester, UK), California Summer Arts, and the Boston Early Music Festival. Recent performances have taken her to New York, Washington D.C., Prague and Nova Scotia. A rare collaboration with the New York Metropolitan Museum of Art culminated in two NY concerts performing on rare instruments from the Museum’s collection, followed by a compact disc recording of antique flutes made of crystal, ebony and gold. At the invitation of the Kennedy Center, Boland performed on the Millennium Stage at the in Washington D.C. at the turn of the new millennium as representatives of the State of Iowa. Dr. Boland is co-founder of Red Cedar Chamber Music. In partnership with John Dowdall, Jan incorporated as a not-for-profit chamber music organization. Jan Boland served as flutist and Executive Director of Red Cedar Chamber Music from 1996-2015. In that capacity, with Artistic Director John Dowdall, she designed and executed the activities of the organization to serve Eastern Iowa with over 80 chamber music concerts and educational events each season. In 2007, they began a three-year residency as National Artists with the New York-based Chamber Music America – one of only four such residencies awarded that season. Red Cedar’s Rural Outreach Concerts attracted the attention and support of the National Endowment for the Arts which awarded them grants ranging from $7,500-$20,000 for 12 consecutive years. A respected scholar, her Method for the One-Keyed Flute (University of California Press/ Berkeley & London) was named a Year 2000 winner of the National Flute Association’s Newly Published Music Competition. In 2017 the Method was translated to Japanese and published in Tokyo by Vorn Musik. It continues to be the leading textbook for instruction of the one-keyed flute worldwide. Her many arrangements for flute in chamber music settings are published by ALRY Publications. The National Endowment for the Arts in Washington D.C. awarded Jan Boland the highly coveted Solo Recitalist Fellowship for 1993-96: the award is given to “the nation’s most promising solo instrumentalists to hone their musical virtuosity, and to enable these exceptional musicians to showcase their talents before a wide array of American audiences”. An active member of the National Flute Association Jan is a member of the Historical Flute Committee and previously served on the national Board of Directors and was the NFA’s first Development Director. She has been invited numerous times to perform at its national conventions, most recently in New York in 2015. The Boland-Dowdall Duo was named the 1987 winner of the National Chamber Music Competition sponsored by the National Flute Association. She was selected to a 26-member delegation from the National Flute Association to participate in a cultural exchange in the Peoples Republic of China 1987. An avid teacher of the flute and chamber music, Dr. Boland is in demand as a teacher at summer festivals throughout the United States; she has been on the faculty of the Boxwood Flute Symposium, California Summer Arts Festival, North Carolina’s Wildacres Flute Symposium, and most recently at Red Cedar’s Summer Festivalsl (which she founded with John Dowdall). Boland was a Teaching Artist at Coe College (Cedar Rapids, IA) for 42 years and Cornell College (Mount Vernon, IA) for 17 years. Boland holds a Doctorate of Musical Arts degree from the University of Iowa; her principal teachers were Betty Bang Mather, Jerrold Pritchard and Stephen Preston. Her undergraduate degree is from the University of Iowa (with distinction) and Master of Arts degree from the University of Northern Iowa.